Note: Syllables spanning two notes are in bold. To Thee, Lord, naught is veiled in night. Teach us the way of truth divine. That Thou wouldst keep us, Lord, this night. God Father, in Thy kindliness. Then we’ll be free of ev’ry care. Grant that our hearts may wake to Thee. And loose us from the bonds of sin. Through Thy five holy wounds of red. Thy comfort, Jesus, be supplied. Attr. Ambrose of Milan, 4th c.
Lehr uns den Weg der Wahrheit ganz. So sind wir mancher Sorgen frei. Und lös uns von der Sünden Band. Dein Hilf allzeit sei uns bereit. Durch dein heilig fünf Wunden rot. Der gib, Herr Jesu, deinen Trost. A translation by William J. Copeland from the Latin original, “O Christ, Who Art the Light and Day,” appears in The Lutheran Hymnal , No. 559, and the Lutheran Service Book , No. 882. 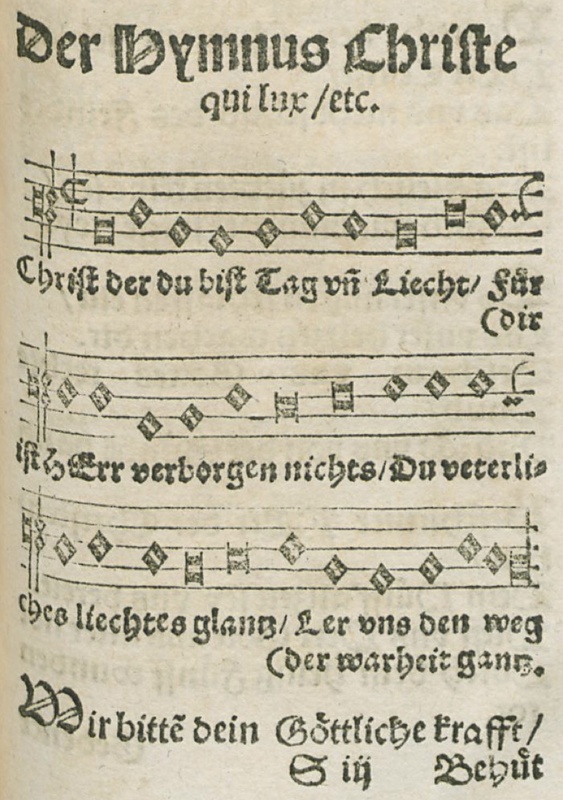 TLH provides the version of the original melody inherited through Layriz and the Mehrstimmiges Choralbuch , but in LSB a different melody is used (the plainchant “Conditor alme siderum“), with no harmonization. For the Free Lutheran Chorale-Book, we have prepared a new translation based on the German version. The music provided here is a new arrangement of the original plainchant melody as found in Babst, with influences from Lucas Osiander and Friedrich Layriz. Both text and music may be freely used and reproduced for any purpose whatever, and are offered with the prayer that they may serve for the edification of Christian people everywhere.